Preikestolen or Prekestolen, also known by the English translations of Preacher's Pulpit or Pulpit Rock, is a famous tourist attraction in Forsand, Ryfylke, Norway. It consists of a steep cliff which rises 604 metres (1982 feet) above Lysefjorden, opposite the Kjerag plateau, with an almost flat top of approximately 25 by 25 metres (82 by 82 feet). The authorities have opted not to install fencing or other safety devices as they felt it would detract from the natural beauty of the site and the fact that fatalities at the site are extremely rare, despite having approximately 200,000 visitors each year. Furthermore, there were concerns that fences or other devices might encourage dangerous behavior such as climbing onto the fences. 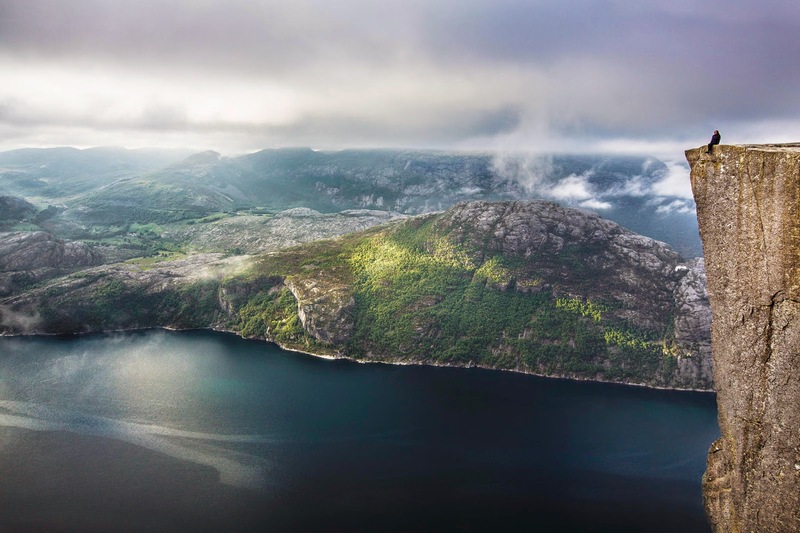 It should also be noted that it is a policy from Norwegian authorities that "we cannot fence in all nature in this country", and this is supported by the Norwegian population who are generally more accustomed to "dangerous nature" of their country than foreign tourists. Via Reddit. See also this photo. Addendum: This video gives a general idea of the access. More info here. Addendum: Reposted from 2014 because I just read in The Local ("Norway's news in English") that Google Maps has just added Preikestolen to Google Street View. It’s beautiful. It’s also fantastic that they leave it alone. The Cliffs of Mohr in Ireland were left pristine for many years until recently when they went all Mt. Rushmore with it creating terraces, fences, and “interpretive areas.” It is now, in effect, a museum exhibit with signs that say look don’t touch. Nature should be a little risky; and without interaction it might as well only be a picture. I think it is also beautiful that a people can be so mature and responsible. Even pictures of something like this make me dizzy. Yeah. My acrophobia has kicked in rather fiercely. Can't watch this. Wowza!!!! Very cool find. Thanks for the new posts? Ever see the Kola Superdeep Borehole? That's a wild story. Ugh, did not mean to type a "?" in above comment. A. I so want to see this place, beautiful. Every summer some foreign tourist falls in one of our waterfalls and die, after climbing a fence or something stupid, but on Prekestolen they usually know it's dangerous and behave that way. There might be a lesson here? I wonder how easy it is to access. Even the Grand Canyon's fences and signage taper off pretty fast once you get a few hundred yards from car access. Maia, I've added a link and video with information about the access. At the Grand Canyon, the rails are only at places where there are large crowds. It prevents people from being pushed over accidentally. I am not thrilled by what appears to be a giant crack the runs from top to bottom where the rocky outcrop meets the mountain. I could imagine hiking all the way to the top and then losing my nerve to walk out to the edge.